I don’t know what the weather is like in your city, friend, but here, it is warm and bright. Yesterday, for the advent of spring, usually so meek, the temperatures soared above eighty. Eighty! It’s strange, and a bit disconcerting, but as I’m powerless in the face of the weather, I am trying to enjoy this with abandon, reminding myself how nice it is to be…well, not cold. But I must note that these springtime temperatures can’t always be trusted. Or possibly it would be more accurate to say that our thermostats, heaters, fans and air conditioners, those human-made contraptions we’ve created to guard ourselves against any natural discomfort, those cannot be trusted. At the end of last week, when the warmth was coming in earnest, my office, which I’ve been told was converted into its present state from a cement-walled racquetball court (?? ), was suddenly stuffy and hot and oppressive, a far cry from the frigid igloo in which I struggled to keep warm whilst also remaining congenial and professional all winter long. Yet on the other end of the spectrum, there is the inevitable chill that descends when we least expect it. When the first warm days came a few weeks ago, my landlords, bless their kind and well-meaning souls, turned off the heat. A few days later, the temperatures dipped back down to freezing. Colder inside than outside, I bundled up in my thickest sweater and a blanket, feeling quite defeated and just so cold. So I up and went to Florida. Early spring days, you see, sometimes call for more than salads and jammy tarts. At times, only soup (or escaping to a tropical paradise) will do. Not the hearty variety we seek in winter–after all, I urged you to set that aside just yesterday–but something lighter and brighter instead. 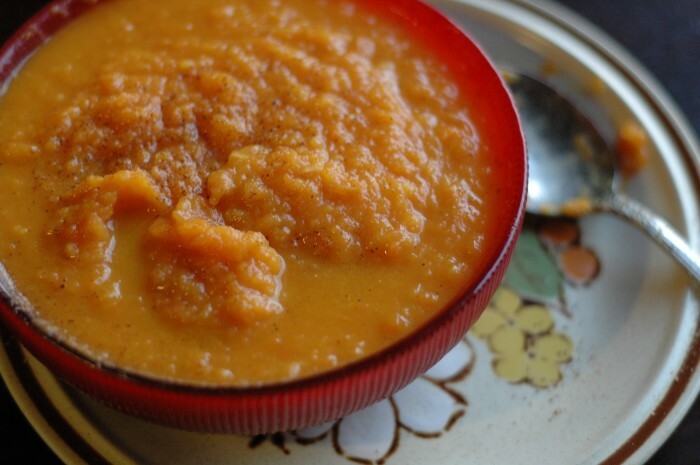 Like Joy the Baker‘s carrot apple ginger soup. 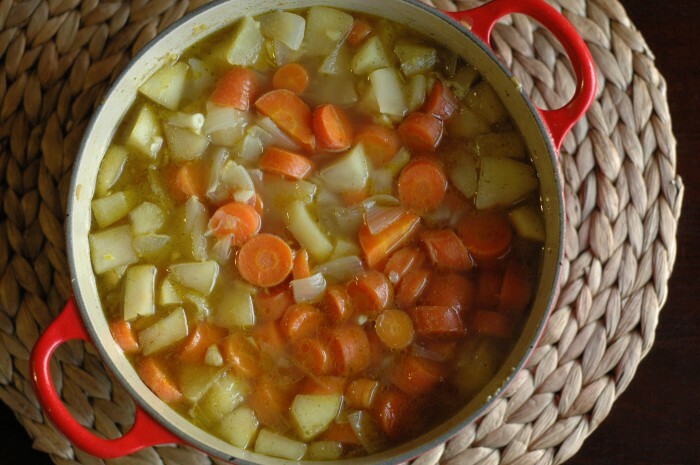 This recipe served me well all winter long, but it’s appropriate, too, for springtime. Feisty from the ginger and one of the more vibrant shades of orange I’ve ever seen, this is one that will warm you without weighing you down. It’s just right for a cool evening but can hold its own on a warm day, too–that is, of course, assuming that your lunching location of choice is more temperate than my apartment or workspace in those pre-spring days. Do you agree, dear reader? Is there a place for soup in spring? 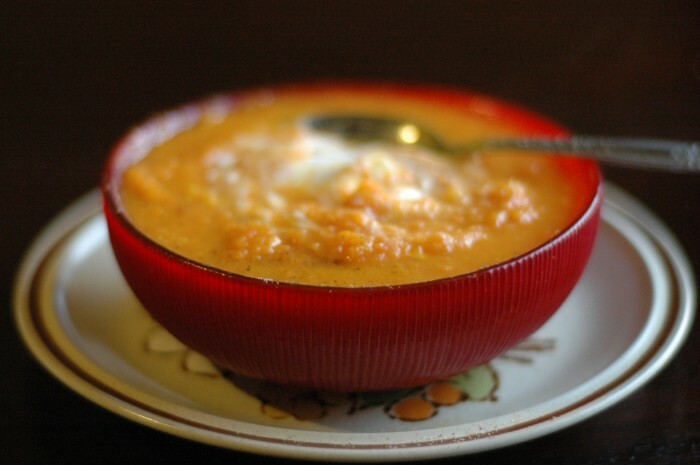 This delicious, healthful soup saves well in the refrigerator for several days and freezes well also. In a large pot, heat the olive oil over medium heat. Add the chopped onion and cook for about 5 minutes, until soft and translucent. Stir in the garlic and ginger and cook about a minute longer. Add the diced apples and carrots; cook for approximately 3 minutes more. Pour in the broth or water. 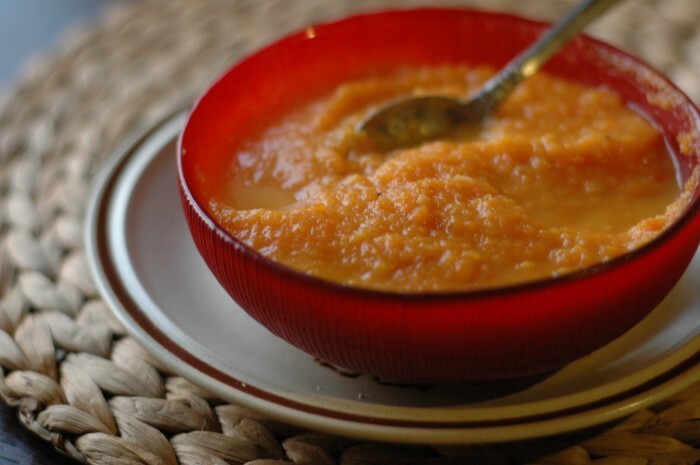 Bring the soup to a boil, then reduce the heat and simmer, uncovered, until the apples and carrots are soft, about 30 minutes. Remove the pot from the heat and let the soup cool slightly. Then, puree the soup with an immersion blender or a blender (for the latter: in batches, and carefully!). If you removed the soup from the pot to blend, pour it back in. Add more broth/water if you’d like and reheat if necessary. Add a few gratings of nutmeg (or a few shakes from a jar) and salt and pepper to taste. Serve with a drizzle of olive oil, cracked pepper, grated nutmeg and/or yogurt atop. It’s a great spring soup! 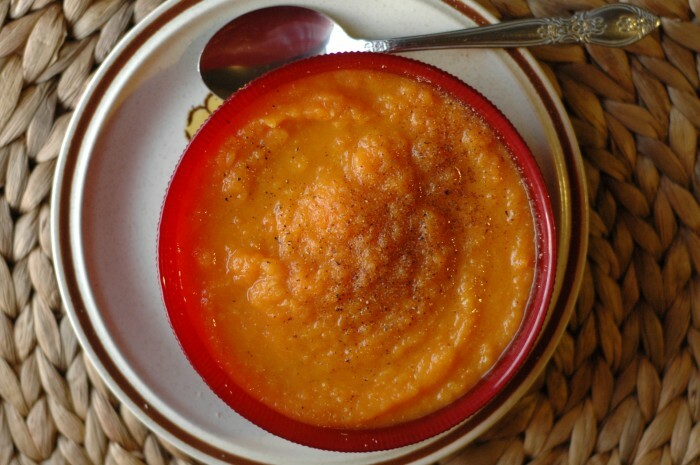 It’s got hearty root vegetables to pair with cool temperatures, but is very light for the approaching warmer days too.